We did another day of shooting on the 11th of November. The sky had long darkened, and the moon was covered by clouds. Only Cassiopeia was visible, but it was so dim that it took nearly five minutes for a friend to realize what I was pointing towards. The night was nearly pitch black. They want us to get used to shooting in the dark, so we did a drill where we shot at a cardboard soldier who happens to be a very dark green. No lights. No illuminated sights or red dot scope or night vision goggles. No nothin'. Just us, a gun, and an enemy. No one was doing very well. Hell, you couldn't even really see the commander telling us what to do. We had to have sticklights (glowlights) set up so we even knew exactly where the entrance was to the shooting range so those waiting wouldn't wander in. It was the dead of night. I wasn't nervous about a thing, but I still wanted to hit the target at least once. I got down into the laying position as instructed. I took my time. I squinted as hard as I possibly could, and I felt like I could kind of make out the top of the target. Kind of. The drill wasn't just plain shooting, though. The commander would countdown to zero, and then yell "FIRE!," but he would wait at some points, skip numbers at some points and just yell "fire" anyway, or not even count at all. And, as per the drill, the point was for everyone to shoot together. That simulates the army experience: if your commander has a reason to yell "fire," everyone should fire together. Another twist in the drill was that the commander was walking the line of those shooting, and if he kicked your boot you had to shoot right away. Remember, everyone has to shoot together. So, he kicked my boot once and I fired automatically, but it took a second for everyone to pull the trigger. 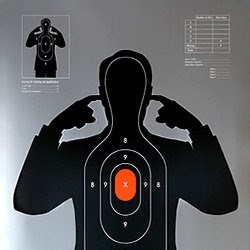 For those that haven't really gotten used to shooting a gun yet there's a lot of hesitation. You don't hear "FIRE!" and there's a gun shot? Did someone mess up? Should I actually fire? I understand that. I figured I did pretty poorly considering I really couldn't see the target. After we finished we ran down the field to the targets and waited for the commander to make his way towards us and individually check for holes with his flashlight. He got to me and I searched with him for the holes. Five in the face. Two in the chest. One in the stomach. That's eight out of ten. Don't even ask me how I did it. I just kind of saw the target, shot exactly when the commander said to, and prayed to get one. I like to think that at least one that I missed was when he kicked me and I just shot, but who knows. What really boosted my morale for the day, which honestly was the lowest that day that it has been during my entire time in the army (nearly a month), was that the commander really complimented me. It's cool to have one of these battle-tested guys be nice to you, but this particular commander is in the special forces reconnaisance unit Palsar 7. He is a total badass. Let's put it this way: I'm thinking about going to the Special Forces Tryout just so I can blog about it. I have absolutely no allusion that I could ever pass that three-day torture marathon where you literally do not sleep. Imagine hell. That's Yom Sayerot. Hey, if it seems like I'm bragging remember that I'm also telling you that I feel like an idiot half the time because my Hebrew isn't quite good enough. I've gotta hold on to the good parts. so I hear you are going to be on the front lines. don't die damn you. I wouldn't get too specific with training methods etc because you don't want to give tips to the enemy. The enemy being civilians on a ship trying to send aid to homeless children.